Got leftover Halloween candy? 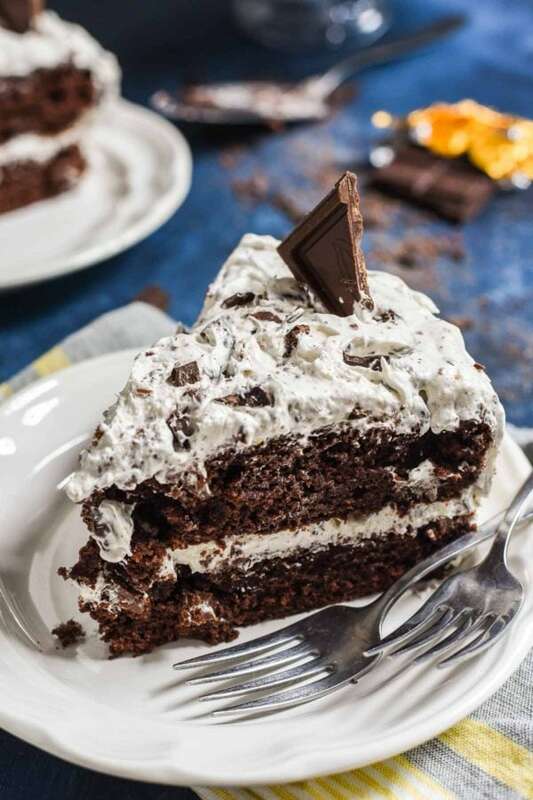 This Chocolate Candy Bar Cake is a great way to use it up! I have a confession to make: I don’t really like candy bars. Are you making a shocked face at me? Or is that a grimace? You’re grimacing, aren’t you? Before you think I’m some kind of monster, let me assure you I like chocolate desserts. I’ll go to town on some one pot fudge brownies or chocolate chunk cookies. But to sit down and eat a chocolate bar? It’s not my thing. The problem is, I seem to forget this when I’m staring at all the fancy, specialty chocolate bars at the store. Suddenly, I’m tossing a Sea Salt and Caramel, a Dark Chocolate Hazelnut, and an Espresso Cream bar in my cart like I’m some sort of candy bar connoisseur. Then it’s Halloween and I’ve overestimated the amount of chocolate we’ll need by about 25 lbs, and before you know it my cabinets look like a scene from Charlie and the Chocolate Factory. I could probably live around this amount of candy for a year, taking squirrel sized bites from the bars every few days. But the Mr. is a candy bar lover, and to ask him to leave this amount of candy alone is akin to putting a dog in a tub of bones and telling him not to eat them. It’s just cruel. So I was faced with the not-so-unfortunate task of having to use up quite a collection of candy bars. 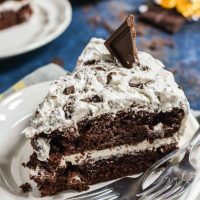 I searched through my old recipe box and happened upon this recipe for Chocolate Candy Bar Cake. I had made it soon after we got married, and though the memory of it had faded, I knew if I took the time to write it on a card, it must’ve been good. I recreated the recipe, this time throwing in the rag tag collection of candy bars I had accumulated the last few months. This cake exceeded expectation on every account. It is surprisingly easy to make. Seriously, I made the cake and the frosting, cooled and decorated it in about 3 hours time, with most of that time being baking and cooling. The recipe starts with a box cake, which is not my usual go-to, but it works in this case. 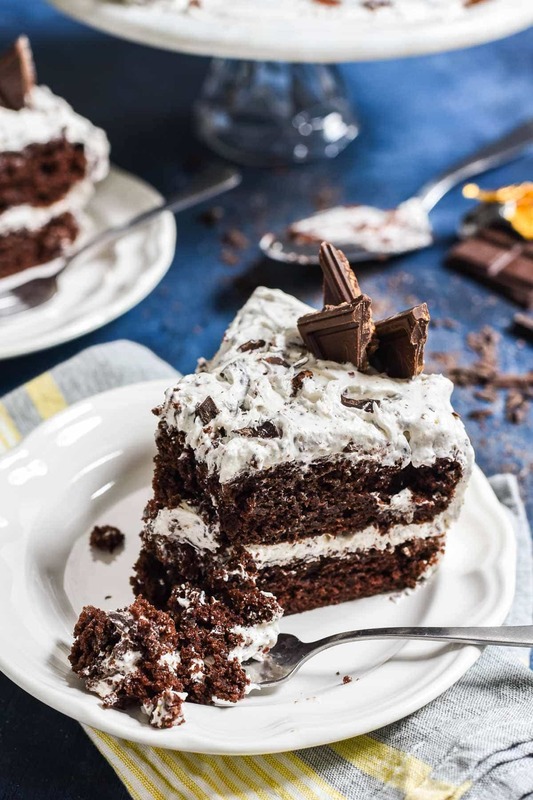 I think next time I might try starting with my Chocolate Crazy Cake, which is also super simple to make. 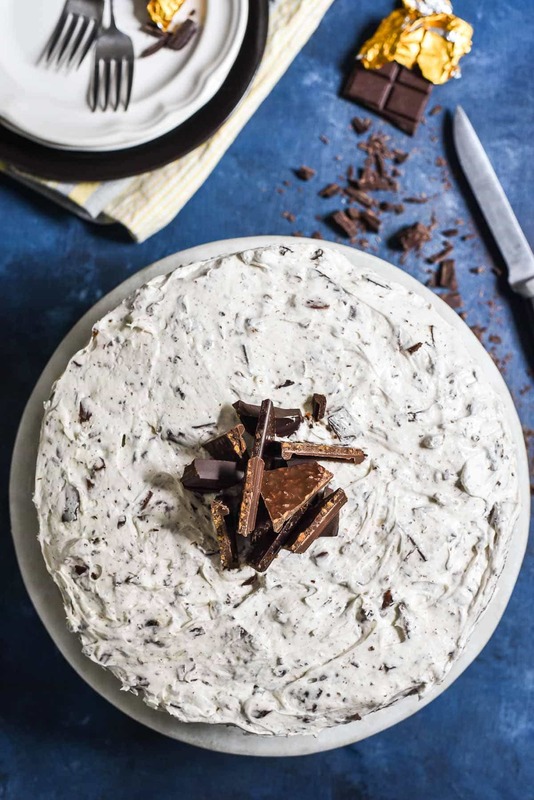 The cake is then layered with the dreamiest, fluffiest frosting that’s filled with hunks of chopped up candy bars (and also happens to look exactly like Oreo Ice Cream!). Mine was studded with bits of caramel and nougat, silky milk chocolate and deep dark chocolate, a hint of hazelnut and the occasional bite of crispy cappuccino. It.was.fabulous. If you find yourself in a bit of candy bar situation come November 1st, give this recipe a try. It’s great with specialty chocolate bars, but equally wonderful with your run-of-the-mill Halloween haul. 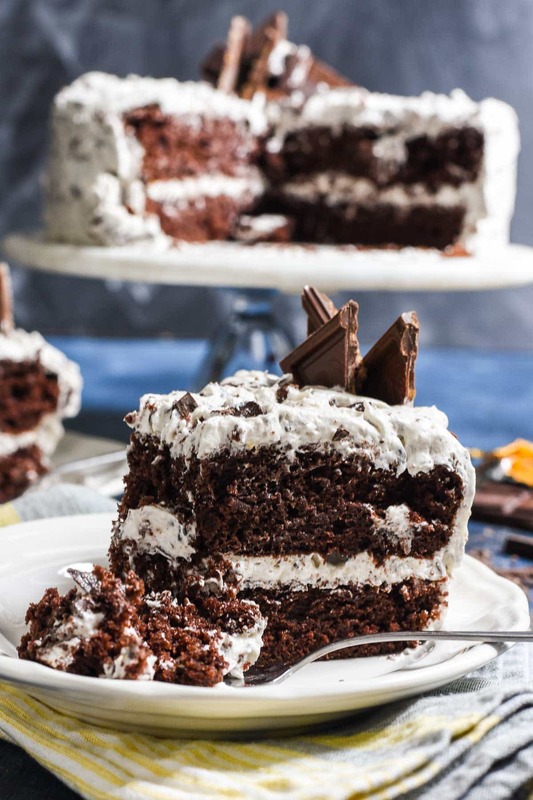 Throw in some Milky Ways or Crunch, add a dark chocolate bar or a Reeses, and every bite will be a sweet surprise. 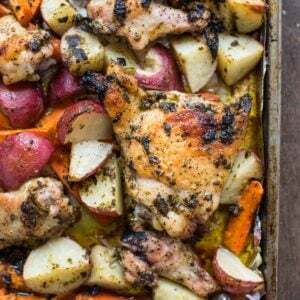 Preheat the oven to 325 degrees. Grease 2 9 inch cake pans (or 3 8 inch pans). Set aside. In the bowl of an electric mixer, beat all of the ingredients for the cake together on low speed. Increase to medium speed and beat for 4 minutes, scraping the bowl as needed. Divide the batter evenly in the prepared pans and bake for 23-27 minutes (for 9 inch pans) or until a toothpick inserted in the center comes out clean. Allow the cakes to cool for 10 minutes before running a knife along the edges and flipping them out of the pans and onto a cooling rack. 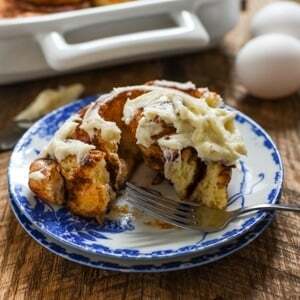 Meanwhile, beat together the cream cheese, sugar, and powdered sugar until smooth. Fold in the whipped topping followed by the candy bars. To frost the cake, place one layer on a flat surface. Spread the frosting over the cake and along the edges. Place the second layer on top and spread the frosting on the top and sides, blending with the bottom layer. Place candy bars pieces on top to decorate, either piled in the center or around the top and sides. Refrigerate until ready to serve.